Today’s risk environment is increasingly complex and interconnected, with risks not constrained by borders or bound by industries. What takes place at the global level shapes regional risk landscapes and what brings risk to one market poses potential risk to broader economies. For this reason, the World Economic Forum took a “glocal” perspective – assessing the risk landscape from both a global and local point of view – in preparing “The Middle East and North Africa Risks Landscape” briefing paper. By using data from the Global Risks Perception Survey – a poll of stakeholders around the world – and responses to the Executive Opinion Survey from business leaders in the Middle East and North Africa, the briefing paper offers an assessment of how global, national, and market risks are coming together to shape the overall risks landscape for the MENA region. Respondents to the 2018-2019 Global Risks Perception Survey expressed concern about the deteriorating international economic environment, with a large majority expecting increasing risks in 2019 related to “economic confrontations between major powers” (91%), and “erosion of multilateral trading rules and agreements” (88%). The potential costs of global trade tensions were highlighted in January 2019 when the International Monetary Fund (IMF) cited trade disputes as one reason for revising down its global growth projections for the second time in three months. These developments hold particular risk for the MENA region, home to trade-dependent economies, where, according to the IMF, the total trade-to-GDP ratio is approximately 66%. The results of climate inaction are becoming increasingly clear. The year 2018 was the fourth warmest on record. In the MENA region, Algeria had the hottest temperature – 51.3ºC – ever reliably recorded across Africa. 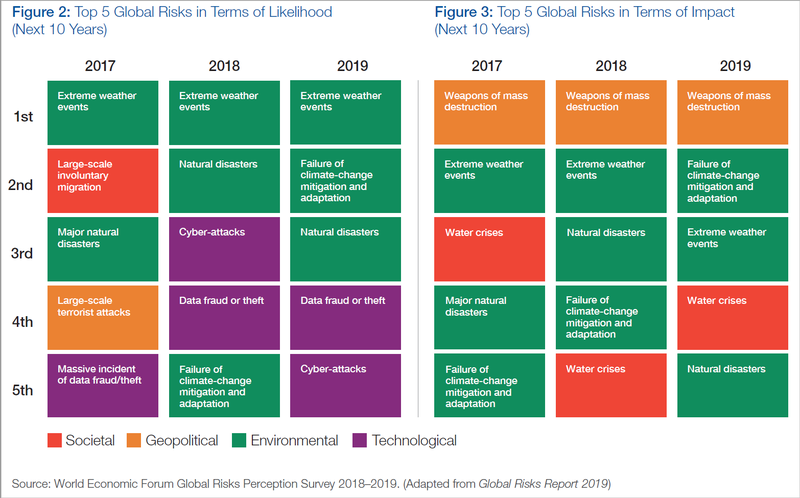 But while global stakeholders ranked environmental risks high as a likely risk over the next 10 years, business leaders in the Middle East and North Africa largely did not include it in their responses to the Executive Opinion Survey – pointing to a potential blind spot in the region in terms of prioritizing the issue. Paradoxically, while the risk of climate inaction is grave – the World Bank identified 24 port cities in the Middle East and 19 in North Africa at particular risk of rising waters – climate action poses a second-order risk to the region as well. As countries around the world take steps to reduce their dependence on fossil fuels to stem the effects of climate change, many economies of the MENA region may feel market repercussions unless they diversify away from hydrocarbons. The top two risks across the region for doing business are “energy price shock” and “unemployment or underemployment”, according to respondents in the Middle East and North Africa to the Executive Opinion Survey. These risks are largely affected by the health of governance in the region. While discussion of reform is occurring in some places, there is a need for more comprehensive measures, including addressing corruption, reducing subsidies and improving access to finance. Speaking in Dubai in February 2019, the head of the IMF, Christine Lagarde was critical of “spending kept off-budget” as well as well as high levels of borrowing. On the labour side, the picture in the MENA region is dire. For the past 25 years, the rate of unemployment among young people has been the highest in the world, and in 2017 the rate was 30%. As 27 million young people enter the labour market over the course of the next five years, governance will increasingly be an issue for the region – risks at the societal level will increase unless governments take steps to expand and diversify economies and support skills-building measures. Respondents to the Executive Opinion Survey survey ranked “terrorist attacks” as the third leading risk in the Middle East and North Africa. Yet, according to the Global Terrorism Database, the number of attacks in MENA dropped by 38% in 2017 from the year before and the number of deaths fell by 44%. One way to explain this seeming contradiction is that “terrorism” may be acting as a proxy in the survey for an overall sense of insecurity. Instability in countries such as Libya and Iraq, fractures – and even outright hostility – between some states in the Gulf and Levant may add to a persistent feeling of insecurity, despite positive trends, such as the decline of the Islamic State. Previous Boeing 737 MAX: how much could the grounded fleet cost the company?